Chester. Of all my Chesapeakes he was my Husband’s dog. They worked well together. Des just had a better way of handling him than me. For me, Chester was almost too much dog; I lived on my nerves when we worked together on the shoots . He was a big numbers dog; happiest when standing covering multiple guns and clearing everything that fell within his eye line without the hindrance or aid of another dog to impede his progress. The winter of 2008/2009 , here in Ireland, was a long one. In October the rains came. The temperate winds from the west came in from the Atlantic raising the water levels that coincided with the high tides of the Autumn equinox. Dublin flooded, Cork city was impassable and the whole of central Ireland became marooned as the river Shannon burst her banks and shed her load farther and wider into the lands that ran the course of her length. Then the winds changed and down from the northeast came the cold drafts of Siberia. And so, as the days shortened and winter deepened Ireland lay frozen in one of the coldest hardest winters that I can remember. It was a morning in early January 2009 that my Husband, Des, set off loaded with gun and dog. He was to meet up with friends in the midlands hoping to get lucky with decoying the flood plains which that had formed along the the far reaches of the Shannon and her tributaries.The northeast freeze up still held most of the country in an icy grip. The winds that persistantly blew in from Siberia that winter had brought in their wake unprecedented numbers of migrating birds…..black and whites, teal , tufties and mallard, all pushed further south and in greater numbers to the more temperate climate that Ireland offered. They picked their spot, the wind seemed favorable enough to keep the birds low but moving and in a position ,they hoped( as that is the word wildfowlers live by), that seemed like a good sheltered spot to draw in teal and tufties to feed. Under the cover of darkness they spread their decoys in an enticing pattern. Then the four guns settled down spread about the reeds that edged the field, that was once a summer meadow but was now knee to thigh deep in cold frigid water. It is the waiting that is the toughest part of wildfowling, when you have nothing to take your mind off the creeping cold that rises from the bottom of your boots and creeps to every corner of your body. As the purple dawn emerged from the bottom of the sky each man peered hopefully for a glimpse of a silhouette against the lightening skyline. Four guns and one dog, a Chesapeake, named Chester. I know for sure that for him on that morning he most likely breathed deeply the scents of what was about to unfold and felt utterly confident that those four guns no matter how far apart they spread themselves could be covered by him alone. It was not long before the lightening sky and biting wind forced the birds to move in search of feeding and better shelter from the relentless cold. The men had chosen wisely. The flooded field lay in the bend of the river where the birds were apt to cut across over the reeds to a narrow tributary further south. The guns were patient biding their time until the birds came within range and one by one they fell. The shots did not deter the birds and they kept coming and falling. All the time methodically sought out and found by Chester as he worked the reeds in the chest deep water. There were long spells where he had to stand waiting on the raised clump of rushy turf behind Des as the cold water lapped around his body but his attention never wavered and his reward was another hunt , another retrieve of warm game all of which were brought back to Des. He gained the undying respect of not only my husband that morning but also of his three hunting companions. Each and every shot bird that was found by the chesapeake was brought tenderly to hand before turning his attention to the angry grey January skies again waiting for the next one to fall. January 2009 River Shannon with Chester. Chester had many vices, ( not least was his knack of singing while waiting for a drive to start),but once he was given the go ahead to start working he did so with such drive, focus and energy that never let up until every bird he could possibly retrieve was delivered safely back to hand. In all his years retrieving there was never a single toothmark on a bird that he returned with. He remained respectful of his quarry to the end. That is what he thrived on and where his passion lay. His knowledge of the birds he hunted was uncanny; one of those few dogs I’ve seen that had the ability to differentiate, in air , which birds were hit in a drive of hundreds and which ones lived to go on for another day. He never gave up on a wounded bird no matter how far it travelled, he would follow the line to where it touched the ground then pick up it’s trail to where it inevitably dug into cover. For a dog that was precious about entering cover at a working test in the quest for a green dummy I watched in wonder many’s a time as he belly crawled under and through bramble patches that would have tested a cocker spaniel to get that bird that he knew was in there. But so too was he clever enough to figure out that if cover had an exit point it was quicker to skip around the back and look for an easier path through. He had no interest in unwounded game, learning quickly that they took too much energy and time to hunt but in a contest of wills between diving duck and the Chessie he was always the more determined not to fail. 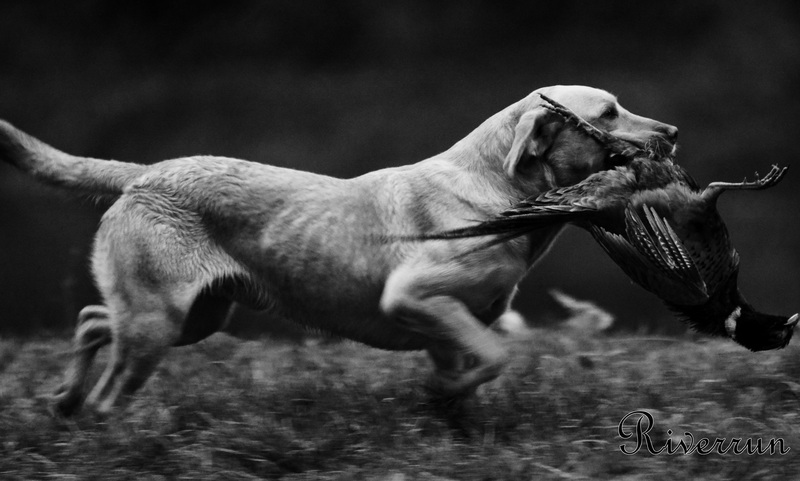 Shelton was his last love, he loved the freedom it gave him to hunt unhindered without being inhibited by tight drives. And so it will be His final resting place. When the time is right we will bring His ashes and scatter them across the tailings for one final hunt through the bushes, brambles and the river that he came to know so well. Chester at Shelton with Des. Two men went to the marsh…..
Two men went to a marsh, they were looking for a wildfowling dog and had been told this was the place they might find one. Both were experienced hunters of upland game and had spent many a winters day following their spaniels across the midland bogs and thick gorse ditches in search of snipe and pheasant. 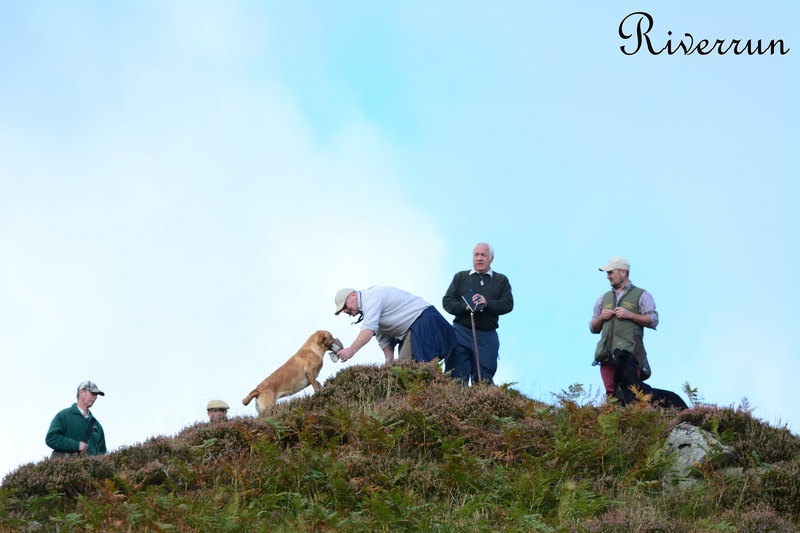 They had enjoyed the high challenging birds of the driven shoot and watched with admiration the dogs that waited patiently and worked silently and almost unnoticed as they gently and tenderly retrieved the birds that fell around their pegs. Times changed the bogs were lost to the building boom where midland villages became commuting towns. 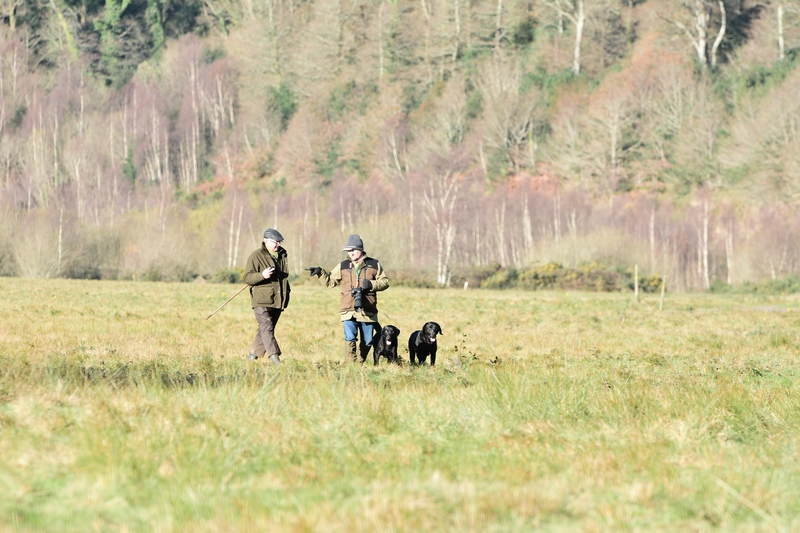 Work brought the men to the southern coast and wildfowling became their sport of choice. The life of a wildfowler is not an easy one. Only the most dogged and determined hunter , ( some might say marginally insane ), will rise before dawn in winter, look out their window and pump their fists in celebration that a force 8 gale is blowing outside. Bring on high tides, heavy swell, dark cloudy skies , lots of wind and the wildfowler is in his element.. Yes, the life of a wildfowler is not an easy one and the dog that accompanies him or her must be as resolute and determined to hunt and retrieve those birds as his master is. For that first year along the foreshores in the south their plucky little spaniels coped well. On the mornings when the birds came in on a low calm tide ,and there were a good many of those mornings, the dogs rarely lost a bird in the heavy reeds that surrounded the marsh edges. It was when the full moon tides coupled with winter storms and freezing winds came that, although the little dogs worked hard, birds were lost and on one or two occasions dogs were dragged away with strong currents and almost lost in the process. The men had grown to love the wildness and unpredictability of this type of hunting but realised that if they were to continue they needed a dog with more strength and substance to deal with the high tide waters and the excruciating cold as they waited out those long hours along the marsh edges for birds to come in…..
On that morning, in late November, winter was in one of her worst moods. A north-east wind bellowed down the shoreline, rain mixed with sleet pelted hard against the windshield where they pulled in to meet their fellow wildfowling companions intent on sufferance for the hours to come. Dogs weaved in and out among cars and humans, tails wagging, caught up in the anticipation and excitement of what was going to come. 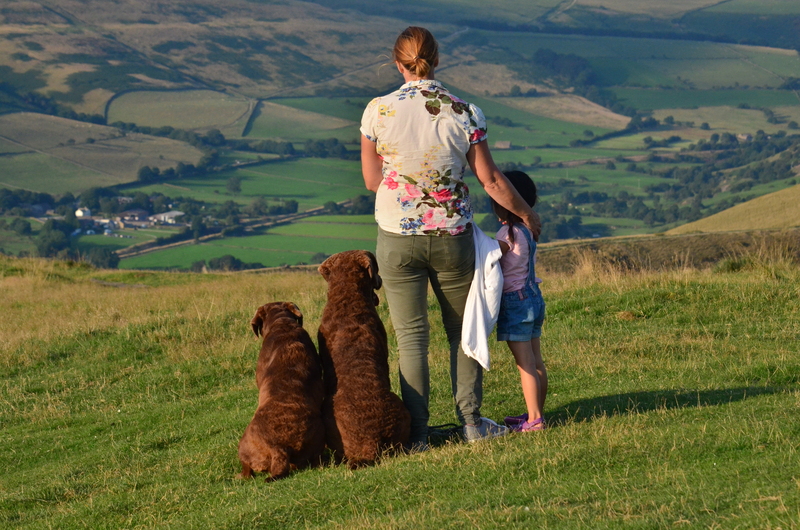 Their silhouettes and body language instantly recognisable as Spaniels and labs. Both were breeds they were familiar with and respected and admired. The dogs they had been told about, though, sat alone in the back of their owners open pick up truck. Chief, the male, and his sister Kuma were Chesapeakes. They showed little interest in the business that involved the spaniel meet and greet. Their amber eyed gaze shifted instead, between what their master was doing and out past the parked cars into the inky distance towards the sea, noses testing the wind for any signs of what the morning’s hunt might bring. There was an aloofness and indifference about their bearing, not unfriendly, just a sense that being here was not a social visit but a duty to their Master. With their size, broad muscular chests and thick wavy oily coats their stature and physique left no doubt that no matter how long it took or how hard the task this pair had every confidence in accomplishing what was to be asked of them..
A call from their master and the dogs leaped from the back of the truck with surprising athleticism for such big dogs and with tails wagging and a houndy ‘roo, roo’ they joined the procession into the marsh. Four guns spread out below the seawall that ran in a C- shape around the marsh, breaking only at one point where the wall had long ago collapsed and allowed the tide to fill the salt marsh twice daily. Tucked in on the southside base of the seawall there was relative protection from the relentless wind although no such respite was given from that cold driving rain. The group settled down, dug their hands deep into their pockets and waited. The dogs sat alert facing into the wind and rain,never wavering from their posts as sentinals; staring instead through half closed eyes off into that middle distance again, noses raised to the wind as if challenging it to blow harder. Nothing changed that was apparent, except a slight shift in the body language of Chief and an almost imperceptible sound like a licking of the lips. It was enough ,though, to make their Master cast aside all conversation, gather his gun and peer into that band of purple half light that promised dawn was coming. Over the seawall, silent, swift and flying low into the wind came a flock of teal. As the first shots rang out across the marsh there was just enough light to make out the silhouettes of two as they faltered, peeled away from the retreating flock and dived into the marsh in front. A single command to Chief and he was off , over the wall and disappeared into the darkness. Whether a bird would remain lost or be found depended on him, his nose, and his desire to use it. Darkness and the impenetrable sea wall precluded any help offered by his master. The bird was found and as he brought it to hand Kuma was sent to seek out the second bird that fell. Their master never rushed them, he had no idea how far they needed to range to find that bird but as long as they stayed out there in the dark hunting they were left to figure it out for themselves. Kuma seemed to have had a harder job finding the second bird, they could hear her splashing through the channels as she worked, snuffling as her nose figured out the myriad of scents that lay within the mesh of marsh grasses, but eventually this bird was also brought back to the bag. Both dogs again settled into their role of sentinals and watched the ever lightening skies for movement. Sunrise never came that morning it was swallowed instead by an angry mix of grey and purple clouds and as the storm strengthened and the tide rose higher the birds moved from the mudflats in the center of the estuary to the shelter of the inland channels and streams for feeding. His companions on either side filled their bags but alas apart from the early teal nothing came our man’s way. 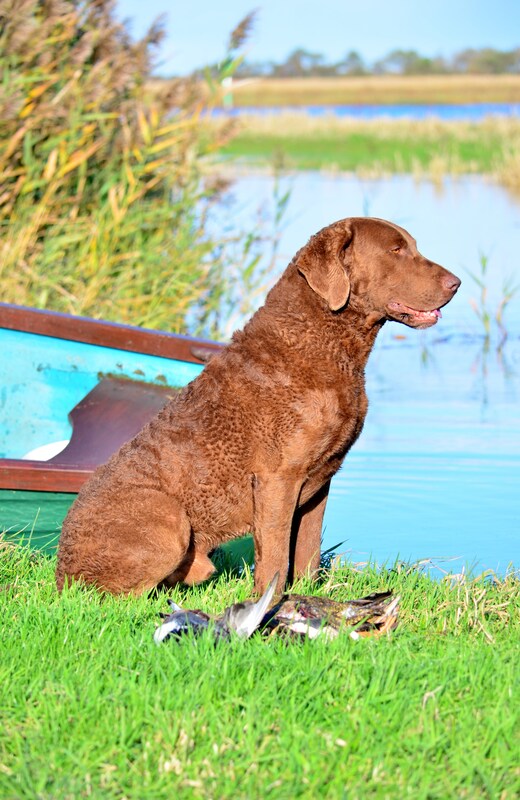 The measure of a good wildfowling dog is not in the volume of birds they retrieve, ( most serious wildfowlers will only shoot what they can bring home to the pot ), but in their persistence and game finding skills of working wounded birds on difficult water. An experienced wildfowling dog will work the current to their advantage, not waste energy fighting it and steadily follow that bird. They know that once a shot is fired and bird down the place to look for a bird is not the sky but the water and the reeds around the water. They will doggedly pursue a diving duck until called off or the duck gives up but mostly they have to learn to be patient, to endure the harshest weather that winter can throw at them and still wait. When the tide was at it’s highest that morning, the Chessie owner and his dogs were called to the end of the seawall by one of the spaniel men. The channel here was at it’s widest and the tide was rushing in at a bracing 4-5 knots /min. The plucky little spaniel had made several brave attempts to negotiate the increasingly strong current in an attempt to cross the water where a pair of teal had been shot and landed on the island. A high bank at the narrowest part of the channel prevented any dog from taking the shortest route across so the only option was to face them into the current and aim for the stoney point at the end of the island. Kuma was to be sent first, her master aimed her for the point of the island. She slid into the water and faced the current and the wind that whipped the water high into frothy peaks around her. It took her a minute to gauge the water but she settled into the current, lifted her head to peer above the waves, aimed for the island and engaged her powerful shoulders to push through that heavy current. Once she banked on the far side the north wind that worked so hard against her on her swim across now became her ally in helping her find that lost bird. 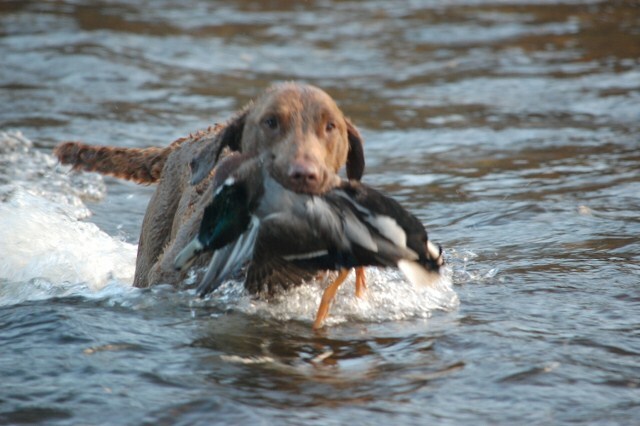 As she returned Chief was sent to retrieve the second teal. He took a similar line to his sister, pushing against the incoming tide as he made his way to the island point. The wind again guided him to the point where Kuma had found her bird but a quick search told him there was nothing there. Without guidance he hunted on, lifting his head intermittantly to test the wind for any hint of scent, retracing his steps to recheck where that bird may be or may have moved from. Then, as before, the men could see his body language change with an increased waving of the tail and nose to the ground he took off through the reeds towards the back of the island and out of sight. The men waited, they could hear him splashing through the deep channels that cut through the marsh bed, the bird was a ‘diver’ it would take time and perserverence to bring this one to hand. 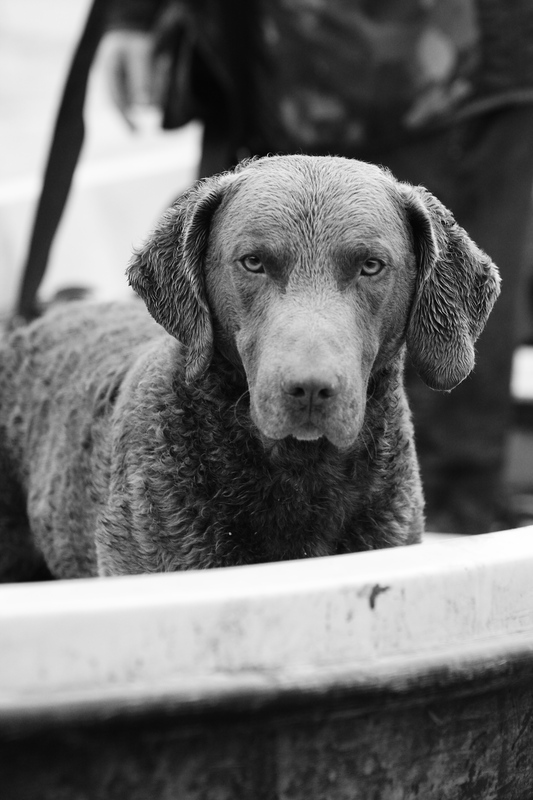 The Chessie owner had learned to trust his dogs, he knew they were serious about the role they played when hunting wildfowl with him. They had long deciphered the difference between a wounded bird down that was worth hunting for and a bird that will live to flight another day. He watched and waited, with the same patience that his dogs had waited out the morning with him he gave his dog time to do his job. 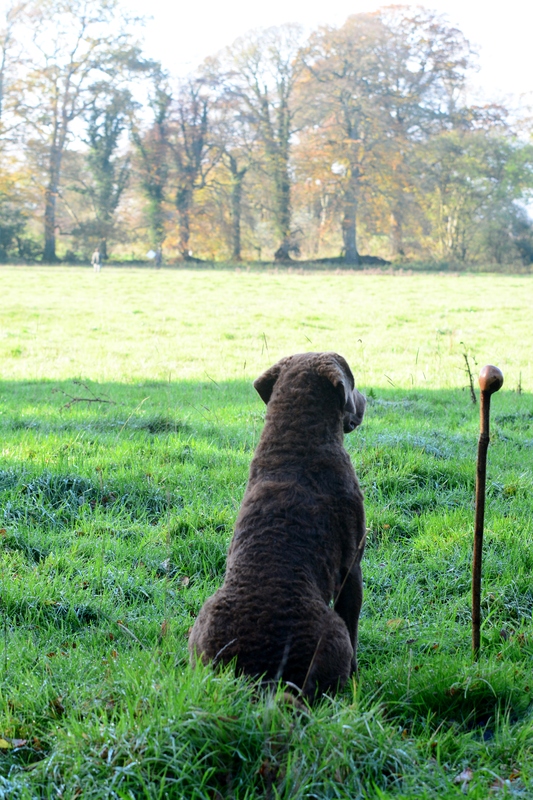 Then the reeds on the far bank parted and Chief was there with his hard won teal in his mouth. He slipped into the water, allowed the current to carry him across and made his way to the end of the sea-wall. 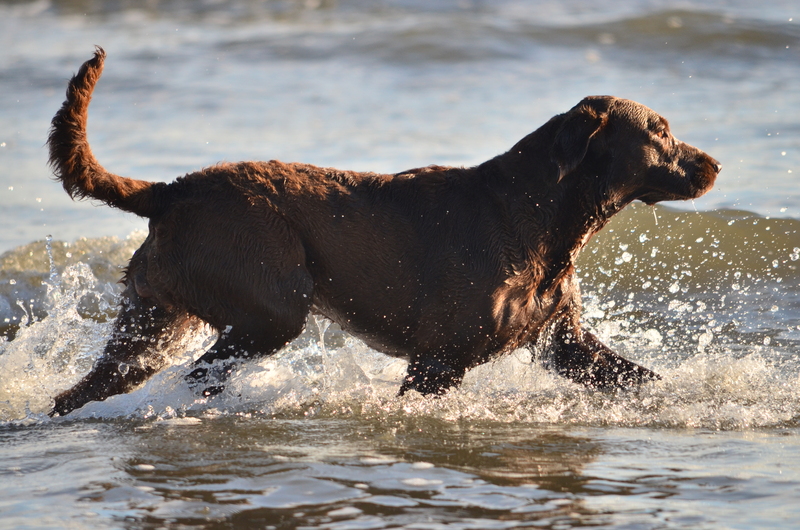 He shook the icy sea waters from his thick brown coat and hesitated as he scanned the line of fowlers and their dogs waiting on the shoreline. None, in his eyes, deserved to receive this bird save one. His eyes searched again beyond them to the top of the seawall and with one final bound and a slight wag of his tail he made his way through the waiting crowd to where his master waited. 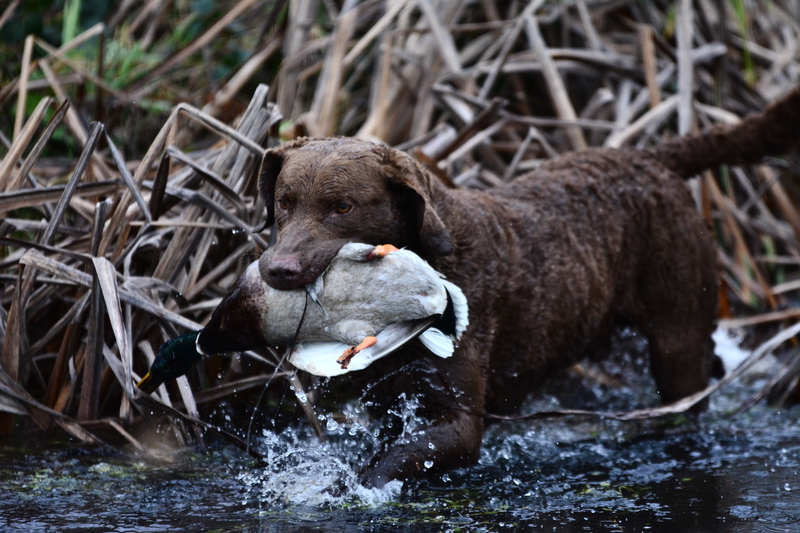 When man created the Chessie …. 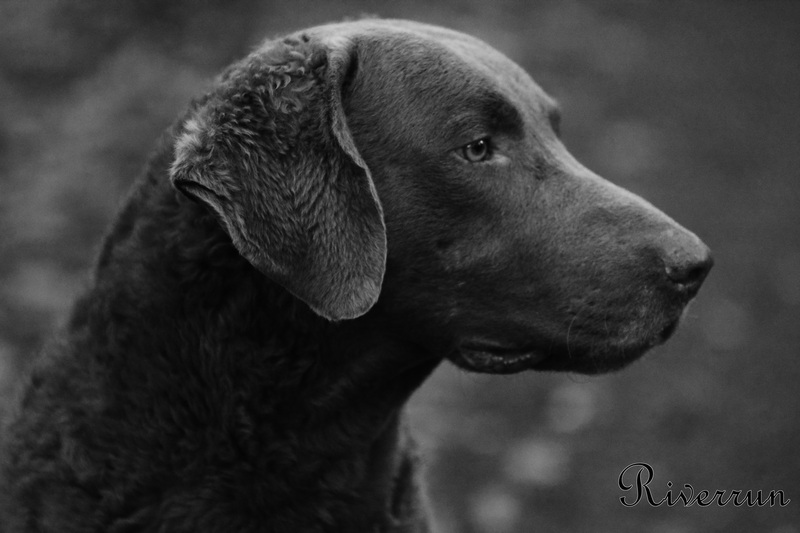 When Man created the Chesapeake Bay Retriever it was for places like the River Shannon. Its name, taken from the Irish goddess ‘Sionna’, means wise river, a name that certainly is reflected in the secrets it holds as you travel its length on a cold Autumn morning. 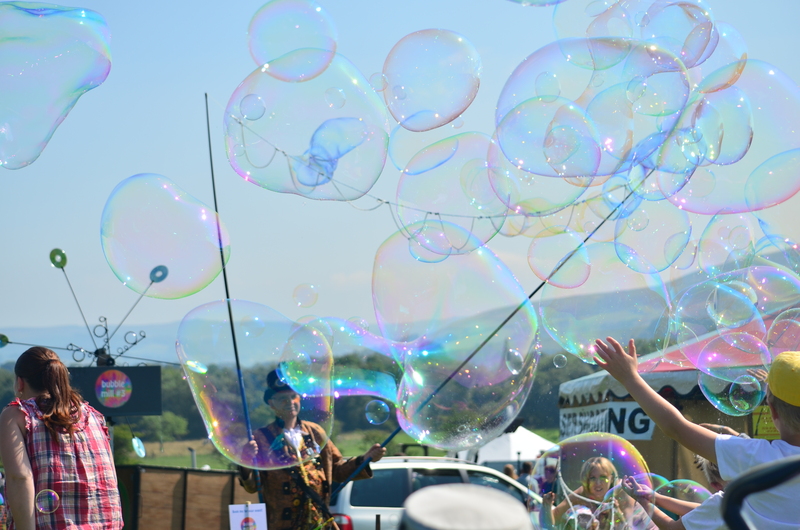 When the skies above and around are filled with thousands of wildfowl, the depth and variety of which is unparallelledd anywhere else on this island, you wonder what is it that attracts them to this particular place. From where the Shannon rises in the Cuilcagh mountains of Cavan it cuts a path through the very heart of Ireland on its way south to the Atlantic. Separating the east of Ireland from west of Ireland, passing through eleven counties, fed by many substantial tributary rivers and widening its girth at three points to form the lakes of Lough Allen, Lough Ree and Lough Derg. It runs for almost three hundred kilometers and most of that is through quiet, unpopulated countryside. The secret to the river Shannon’s success in drawing in such diverse numbers of birds most likely is due to her shallow basin. This has prevented massive use of the river for industrial development and also much of the surrounding land is bog land thus preventing large scale intensive farming. 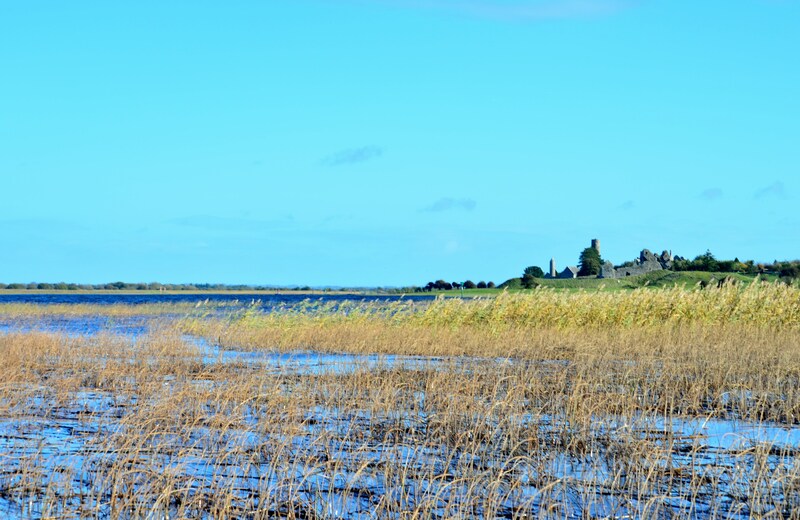 Once the first heavy rains of Autumn blow in, the Shannon spills her banks and spreads for vast distances across the surrounding countryside sometimes reaching widths of a couple of miles. A dog worked over this type of flooded bog land does not require great speed or knowledge of straight lines. 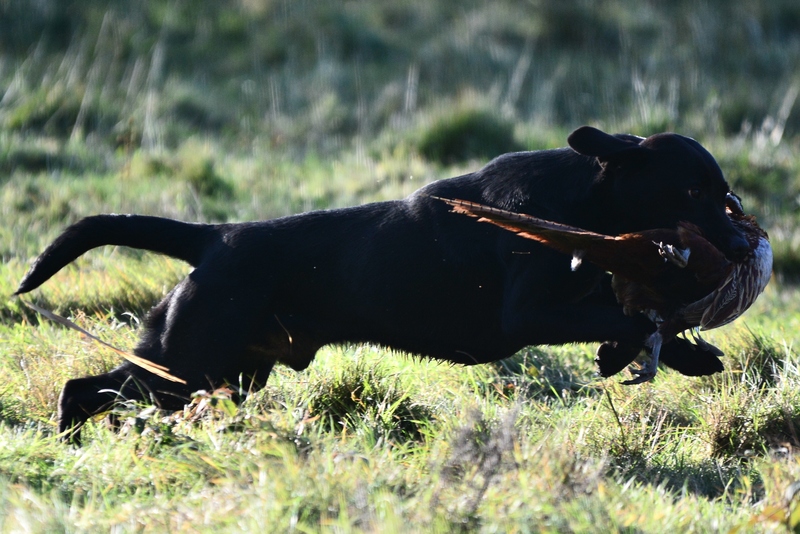 Strength, soundness of limbs, endurance and the tenacity to stay on a bird when all the elements of nature are fighting against him are much more valuable in a wildfowling dog in this particular environment. When I arrived to my friend Pat’s house last Tuesday morning the river level was at a tricky stage, it was not quite high enough yet to decoy on the floodplains, our only option was to take the boat and walk into spots along the way. 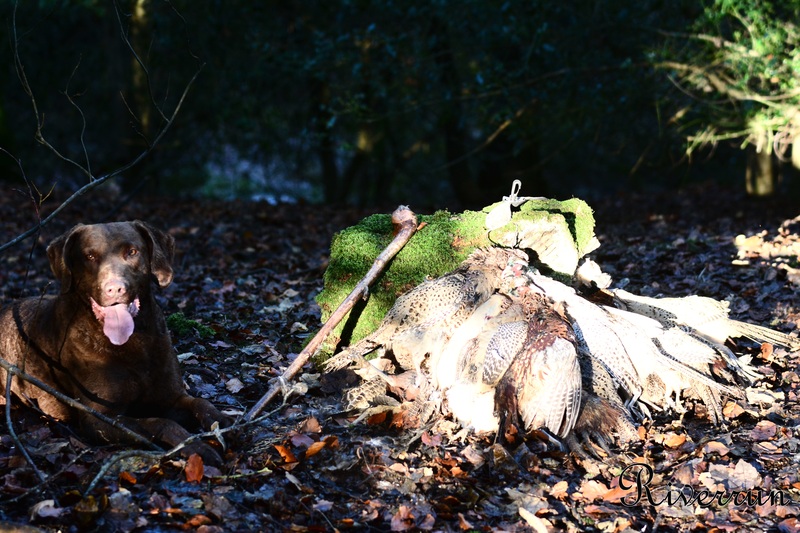 I wasn’t expecting much, the weather, which seems to be usual for my forays wildfowling, was bright and sunny but it was wonderful to be out in such beautiful surroundings with my dog and gun for the first time this season. By mid-morning we had pushed off from shore and Bertie’s tail beat a steady rhythm against the side of the boat as he snorted in great gulps of air, his eyes scanning the reed banks for movement as we clipped along the water. Even on its calmest days, like last Tuesday, the Shannon waters’ demand respect. 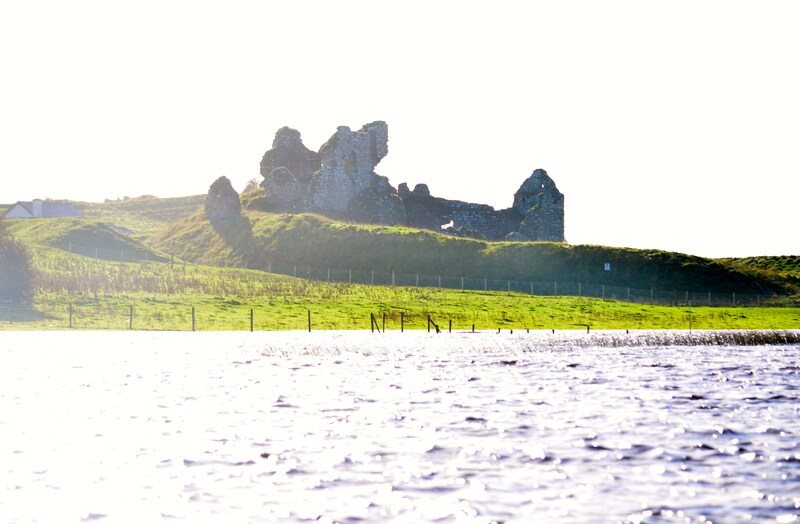 As I looked down into the peaty waters that flowed past the boat a shiver ran through me. The wide expanse of water allows the slightest breeze to whip up a swell. The prevailing winds coming from the south west and the rivers current, which is flowing south, are at constant odds with each other. There was no shortage of birds to be seen either. Migration had started and the low fields on either side of the river were filled with lapwing, starlings and golden plover. All rose in one single mass as we passed and synchronised their erratic flights making it difficult to my untrained eye to pick out the goldens from the lapwings and the starlings. They were here in their thousands. I could see vast numbers swoop in black bands against the grey sky in the distance. We saw reed buntings, mute swans, whooper swans and all the while on either side of us, but just tantalisingly out of range, flocks of mallard and teal got up from the reeds and saluted us as we passed. Pat has spent his entire life hunting and fishing the Shannon and having somebody who knows these type of waters well is essential for this type of shooting. Not only to have knowledge of where the birds will drop in to feed but more importantly knowing the water and all the factors which influence the river such as wind direction, surrounding land and movement of the birds. One foot placed in the wrong spot can have catastrophic consequences and I’m not just talking about a soggy sock!! When the river floods over bog land what looks like three foot of water is in reality an extra two foot below as your foot sinks through the peat. The effort required to walk this type of terrain certainly made decoying a more appealing option. Our first bird in the bag that morning was a female mallard. We had just pulled into reeds after seeing a group of teal lift along with some lapwing. A good spot for feeding, and on this occasion Pat’s instincts were spot on. A duck and drake mallard wheeled off to our left. One clean shot brought the female down in the field beyond the reeds. 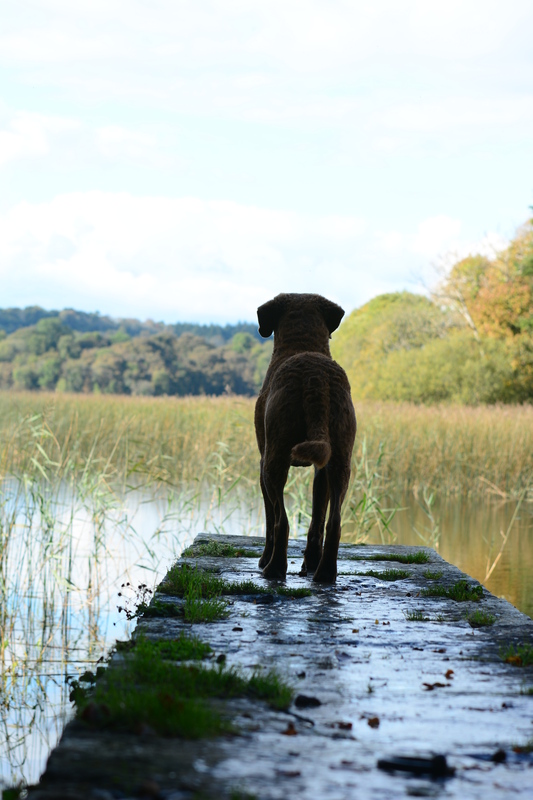 I sent Bertie and he launched himself from the boat and waded through the reeds . The water here was chest height but the peat bottom made it doubly difficult. It would have been almost impossible for either Pat or myself to wade through that type of ground. Bertie needed to use a combination of drive from his rear and strength to pull from his front to keep his momentum going as he worked a path through to dry land. 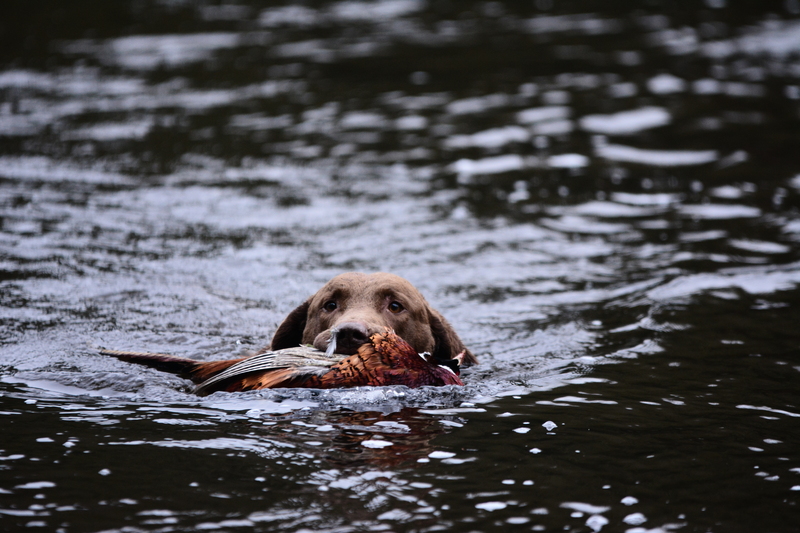 He needed no reminder as to where the bird fell and swiftly picked the duck for His first retrieve of the season. 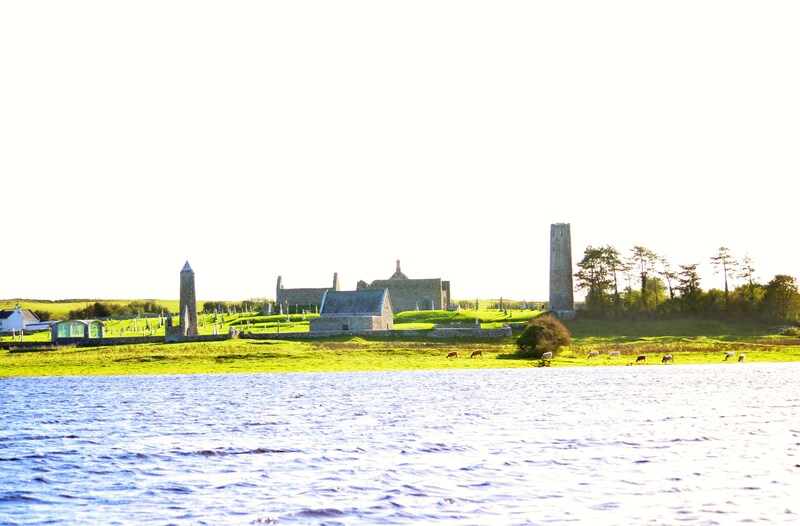 We had just passed Clonmacnoise Abbey and as we came round a bend in the river there was movement everywhere. The fields on either side were low and green and had attracted large flocks of lapwing and plover, the wind carried their high pitched screech up towards us. Swans were feeding in the shallows behind the reeds. This looked like a promising spot. We edged the boat into the reeds again, cut the engine and waited. It didn’t take long before a group of Wigeon passed just within range. The first hit the water with two more winged and flying on to the far bank. The bird on the water was stone dead, not going anywhere, but it was the obvious one that Bertie marked. 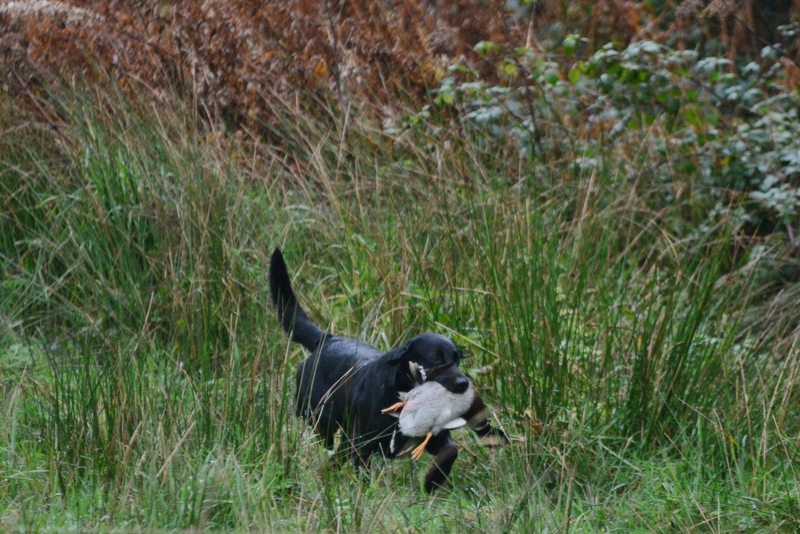 However, the two wounded birds on the far bank were the more important retrieves to take. We moved the boat out and retrieved the bird from the water en route to the far bank. Pat had a rough mark on both birds. The first was easy, I spotted its head up before we reached shore and cast Bertie from the boat, hunted him to the area, he found it easily and brought it to hand. We pulled the boat to shore and walked in from there. Finding solid footing was difficult. Each step found my leg disappearing to knee level. 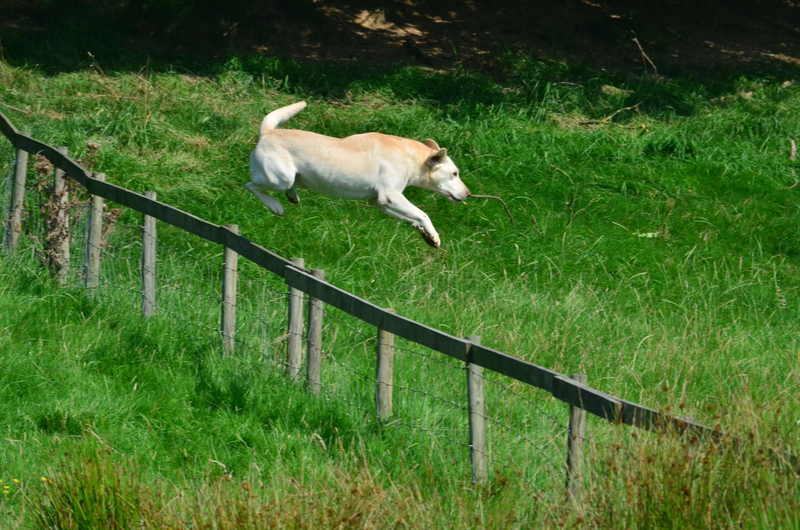 I sent Bertie on ahead to a fence line where Pat had seen the bird come down and asked him to hunt from there. He picked up scent quickly and hunted a tight area but lost it again. I cast him left down towards the river where he dropped his nose to follow a trail and there just along the shoreline we found our duck. River Duck on the Avoca river. This is a completely different type of water but equally as challenging. The basin is deep, carved out of the granite Wicklow hills and fed by numerous fast flowing rivers. By the time the river reaches the point where the Shelton drive begins it is wide and fast as it hurries towards the Irish sea. The loose gravel bed means the water channels shift and swirl developing sweeping narrow streams within the river that are flowing at twice the speed of the remainder of the water. As we set ourselves up beyond the gun line on the river bank it was almost four o clock. 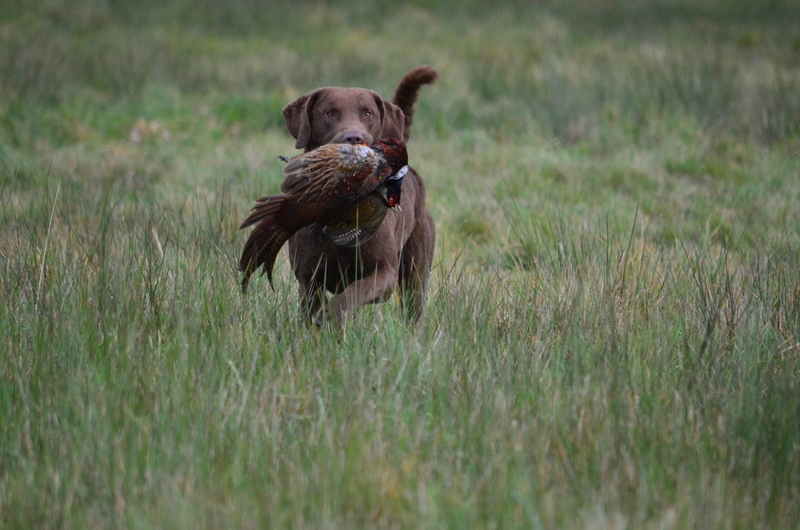 The dogs had been working solidly, retrieving driven pheasant, since ten o clock that morning. The light was fading fast and temperatures were dropping. The dog’s knowledge of how the currents work is important, they need to know not to fight against the charging white water. An experienced dog will slip into the current with little effort then turn into it and work slowly across. The fact that they may be carried downstream as they work forward will not bother them , in fact many times they will calmly thread water focussing on the river ahead and waiting for the current to carry that bird to them. Once retrieved an experienced dog will go with the current until it carries it close to the bank, which again will be forty- fifty meters below its starting point. The drive is fast, intense and finished in thirty minutes. In that period of time any single dog working the water here will have made a minimum of ten retrieves. 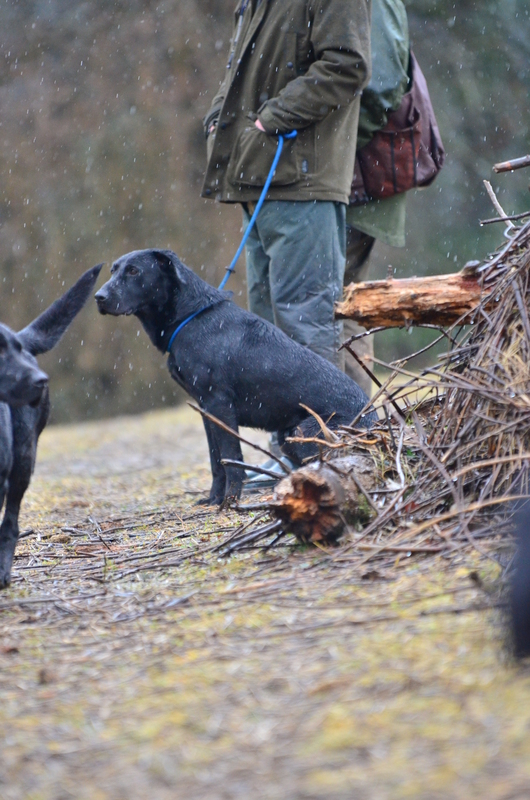 Only the strongest dogs on the shoot will work the waters at the widest and fastest point in the river. It is exhausting cold work for a spaniel or some of the finely built Labradors who remain on the riverbank but are kept busy with any duck that land in the cover there. It is easy to see why the Chesapeake excels at this particular type of work and why it is so important that not only their structure remains as it currently stands but also perhaps to a greater degree their strong mental attitude. The terrain they were built for gave no quarter to half hearted effort. 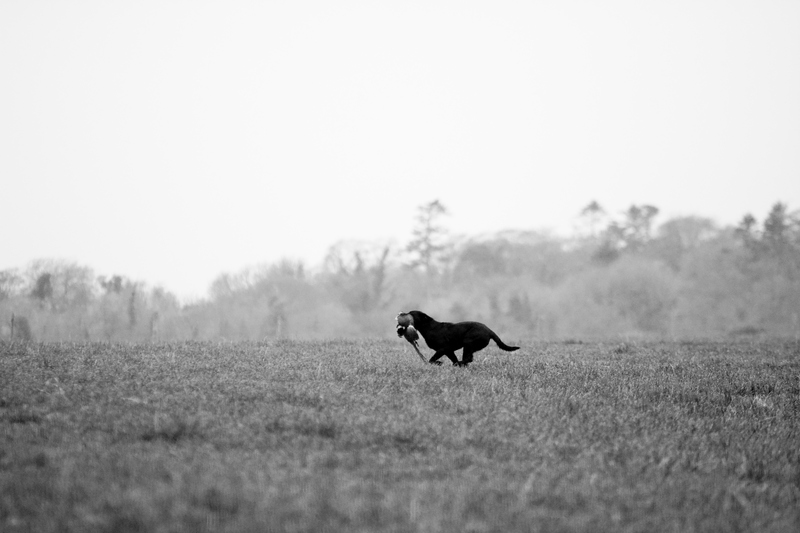 A strong front and sound rear drive is certainly an asset when a dog is pulling its body through the glue-like peat in pursuit of a retrieve along the banks of the Shannon but without an equal measure of bloodminded determination ( which Chessies possess in abundance), many more birds would be lost when tough retrieving is required. Our final bag on the Shannon yielded one mallard, three wigeon and two golden plover. I marinated the wigeon and mallard breasts in spices and orange juice. Roasted them for twenty minutes and then deep fried for a minute. Served with some sweet chilli dipping sauce….absolutely divine…. Vintage Massy Ferguson tractors shined, greased and oiled to perfection chugged their way along the road in convoy through the moors, their drivers waving us by in salute whenever the road straightened enough to do so. A heavy fog hung over the valleys but on the higher peaks great swathes of purple heather broke the otherwise grey morning. 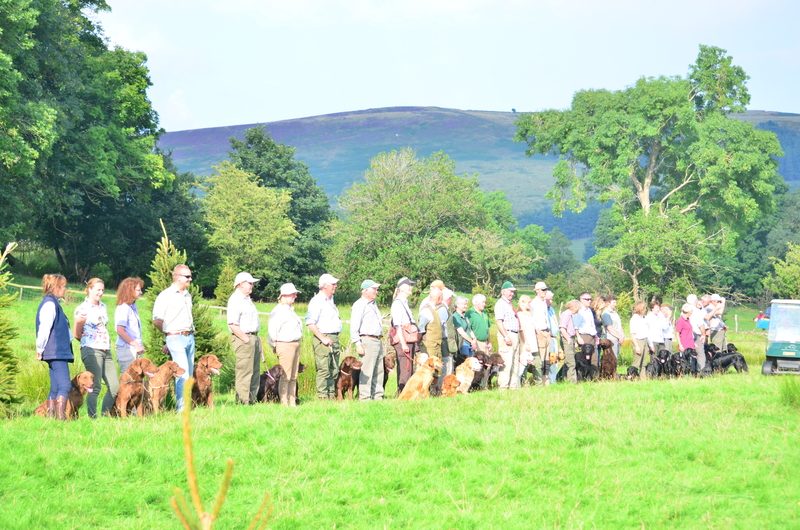 We were on our way, in our own little Chessie convoy, to Hope Valley Agricultural Show to compete as part of a team in a retriever working test. 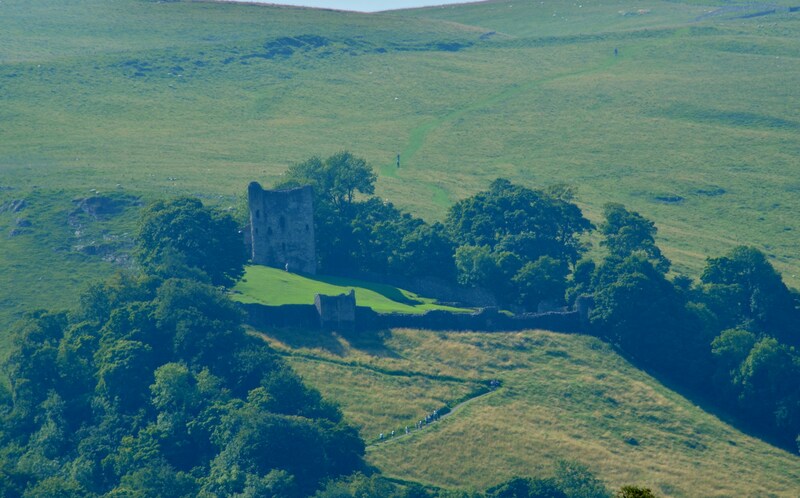 The view from the showgrounds – Peveril Castle. 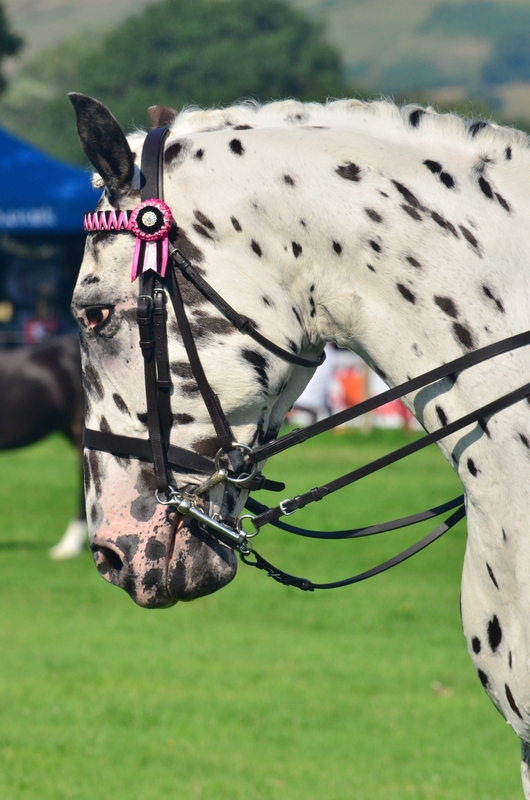 Do you know what I love about agricultural shows? There is a comfort in knowing that people still take pride in the art of jam making, baking cakes, knitting and needlework to enter them in competition. The preservation of certain specialised breeds and types of sheep, cattle, pigs, horses and goats is ensured as long as there are stockmen and women interested enough to bring them out to be judged against a standard. Wandering around the back of the holding pens you see just how much care and attention to detail goes into presenting their animals in their best possible light and the judging is intense, every inch of the animal is examined…the horsemen taking it to an extra level by even having the judge ride each horse in the class. These are our heritage, I feel, skills that if lost will surely leave us poorer as a race. Which is why I feel that in our own sport working and showing our gundogs should continue to be an important part of bringing our breeds into the future. Hope Show had everything on offer that day from sheepdog trials, show jumping and one of the most unique retriever working tests I have ever been a part of. 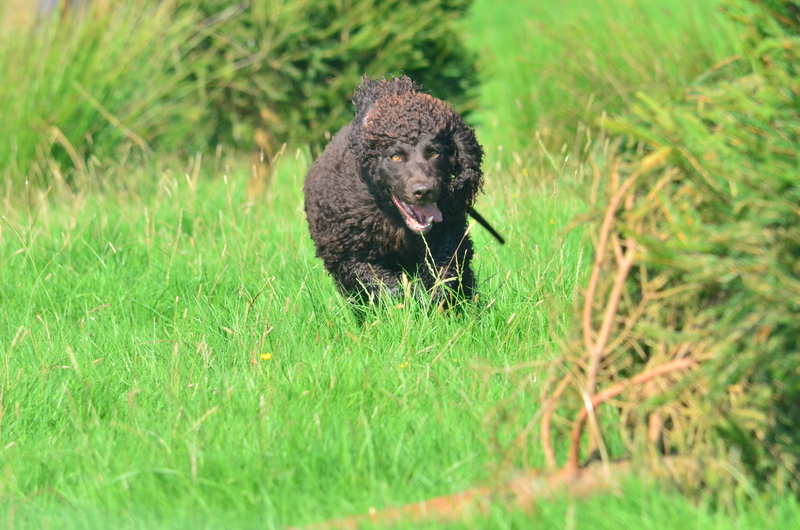 Irish Water Spaniel in action at Hope. The fog in the valleys cleared quickly to reveal Derbyshire county at her finest. Sapphire blue skies created the backdrop for the rugged ridges of Winnats pass and Mam Tor. As the day warmed up the most amazing sight of dozens of hang-gliders resting like giant butterflies on the side of the Tor could be seen before they lifted off and glided gracefully to the valleys below, allowing the air thermals and breezes to carry them in whichever direction they wished. It’s not always the easiest to run from the front but we started well that morning, scoring well above average and were in the lead after the first four teams ran. By the end of the third series in the afternoon we were still holding well in second place, with just the Yellow lab team stretching the lead in front. 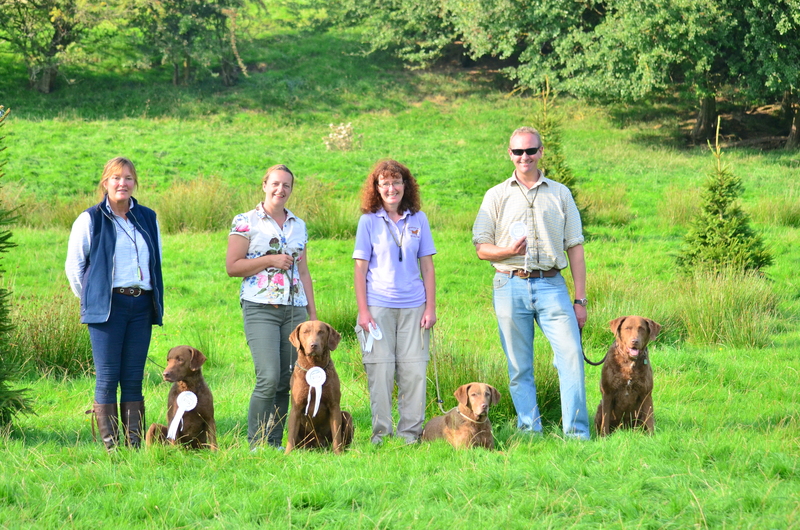 The yellow Labrador team put in a strong challenge to immerge victors. The last test series was upon us and as we stood in line for the last time I could certainly feel the pressure. The teams were piling up behind us, slowly but surely pulling back points with each retrieve. We needed a fairly clean sheet to hold our position. The eight teams line up for presentation. In hindsight I would have handled Bertie differently. My intention was to get one of the ‘runners’ but he thought otherwise and pulled left from the start towards the area of an old ‘fall’. It’s always a split second decision in these cases. Of course in training I would have immediately called him back, gave a definite ‘leave’ command to his left and recast him right but in competition there isn’t this option. There were two choices running through my head the moment I saw the direction he took…let him run on to the fence, clear it and then stop him and cast right or stop him immediately cast right/angled back and then over. In that split second I chose the former and it was the wrong call. Three whistles more than I would have liked to get him back down the field to the area of the fall. He got the ‘runner’ and subsequent three bonus points bringing his final score to 18/20. Now we had to sit back and wait, hoping that the remaining teams would stay chasing our heels and not overtake. In the end there were too few mistakes from the chasing pack we finished fifth overall and got a certificate of merit rosette. 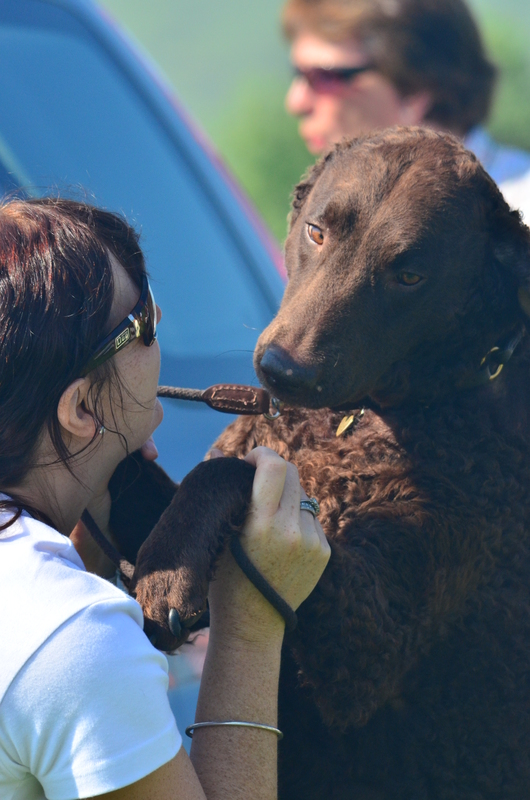 We had set a great challenge and as we stood in line for the presentation with the other teams I felt very proud and honoured to have been invited to run and represent our lovable brown brillo butts…..maybe next year we’ll reclaim that silver cup…. 18/20; 20/20; 18/20; 15/20+3 bonus points. The time had come to leave in chessie convoy but this time we took a turn right on leaving the show grounds and followed the road through Winnats pass and up to the base of Mam Tor. We parked the cars and trekked all the way to the top with six chessies and a tough little four year old girl. It was after seven in the evening but the air was still warm. All along the path on our way to the top flying ants were warming up their wings before lifting off into the evening air. And finally we were there and it was so worth the climb. To think this great expanse of openness is just thirty minutes drive from one of the most densely populated cities in the world is a testament to how the British have valued the preservation of their rural landscape. The view from the top of Mam Tor.